The Kempsville Lions Club was turning up the heat in support of Journey For Sight held at HolidayTrav-L Park on April 29th, 2017 from 9:00 am until 12:30 pm. We cooked hotdogs and hamburger with all the essentials (onion, relish, pickels, chips). We made enough for 100 people. The weather was hot and sticky, but thank goodness for trees and a slight breeze that made it bearable. Come out and see us at our next event. Thanks for your support! The Kempsville Lions Club held our 27th Annual Charity Golf Tournament at Heron Ridge Golf Club on April 21st, 2017 from 11:00 am until 5:00 pm. The weather was absolutely beautiful and there was even a cooling shower for a couple of minutes. Overall a successful tournament. Money raised from this fundraiser goes back into the community we serve - your community! Come out and see us at our next event. Thanks for your support! The Kempsville Lions Club held our beginning of Spring 2017 Blind Made Broom Sale at Fairfield Shopping Center on April 15th, 2017 from 10:00 am until 4:00 pm. Please come out to our next broom sale and see us and get your quality broom. Don't need a broom? Come out and say hello. Thanks to your generosity we were able to raise over $600.00. Money raised goes back into the community we serve - your community! Come out and see us at our next event. Thanks for your support! The Kempsville Lions Club was invited to come out to the opening ceremonies of the Pony & Colt league baseball association. After 3 years of being rained out on opening day, the weather today was beautiful. We set up a table with membership information and even sold a case of brooms. The Kempsville Lions Club has long been a supporter of Pony & Colt leagues. Please see our photo slideshow below. The Kempsville Lions Club held thier Inauguaral Lions Oktoberfest 5K on October 16, 2016 @ Mt. Trashmore. We had 95 runners show up and run. The weather couldn't have been any better as it was mostly sunny and 72 degrees. We would like to take this opportunity to thank everyone who came out to support our run and our cause. We had a blast and hope you did too. A special shout out to Ainsley's Angels for joining us today. Please let us know your thoughts on improving our run. You can send them through our Contact Us page or click on the emaill link kempsvillelions@yahoo.com. Thank you to the Kempsville community for coming out and supporting our club and our fundraiser. We couldn't support our community without our community supporting us, so Thank You. See you next year! The Kempsville Lions Club held our End of Summer 2016 Blind Made Broom Sale at Fairfield Shopping Center on September 10th, 2016 from 10:00 am until 4:00 pm. It was a steady flow of people looking for our quality brooms. In the end we raised over $691.00 dollars for our Sight and Hearing Programs. Please enjoy the slideshow of our participants in this sale. Thank you to the Kempsville community for coming out and supporting our club and our fundraiser. We couldn't support our community without our community supporting us, so Thank You. See you at the next event! Virginia Beach - James O. Stocks, Jr., May 14, 1925 August 23, 2016, a quiet man who touched many lives, died at The Gardens of Virginia Beach surrounded by his wife and children. Born in Winterville, NC, Jimmie retired from Bowman, Foster and Associates after a long, successful career in the electrical engineering and many related mechanical fields. Jimmie was devoted to his wife, Edna (married 73 years), his children James R. Stocks (Alicia), W. Steve Stocks (Nancy), and Molly S. Phillips (Alan). He also was devoted to his grandchildren, great grandchildren and great-great grandchild. He was very loyal to his church, Kempsville Baptist where he was a member for 70 years, a Deacon, and a Trustee and to Kempsville Lions Club. He was awarded a life-time member of the Lions Club. In addition, Jimmie was a World War II veteran. The family wishes to thank the staff at the Gardens and the team from Interim Hospice Care for their loving, gentle care. Visitation will be from 6-8 pm Friday, August 26th at Rosewood-Kellum Funeral Home on Witchduck Rd. The funeral service will be at 1 pm Saturday, August 27th at Kempsville Baptist Church. Memorials are suggested (in lieu of flowers) to the Historical Pleasant Hall at Kempsville Baptist Church or Kempsville Lions Club. Online condolences may be given to the family at www.kellumfuneralhome.com. Virginia Beach - For several years, Bob Fall struggled to maintain a reasonable level of activity to accommodate his failing lungs. He was diagnosed with emphysema at age 36. His fight with COPD was lost in the early hours of July 19, 2016. Robert Henry Fall III was born January 18, 1929 to Clara Bowman Fall and Robert Fall Jr. in Arlington, MA. In 1931, Robert Fall Jr. moved his family to Albany, NH to be with Shell Oil. Bob attended school in a one room school building and often skied and biked to school. The family along with cousins and uncles summered in Conway, NH where he enjoyed life at Iona Lake. He had fond memories of boating, tenting, swimming and much family participation. In 1941, Bob was enrolled in Boston Latin School and graduated in 1946 after having spent many hours on hockey ice and football fields. He was accepted at Tufts College, but the US Navy beckoned him in 1947 when his obligation to repair his friend's totaled car took the money that was reserved for Tufts.He went to basic training at the US Training Command, Bainbridge, MD as a Seaman Recruit followed by A School in Jacksonville, FL. ('47-'52) His primary job was Aviation Electrician and then Plank Owner of USS Coral Sea ('52) and Plank Owner of ATU 601 as Petty Officer 1st Class Electrician and Flight Crew at NAS Hutchinson, KS. In May '55 he entered Officer Candidate School in Newport, RI graduating as an Ensign and assigned as electrical officer on USS Wisconsin, where he was promoted to LTJG ('57-'59). He was Weapons Officer on USS A.J. Harris and left as LT. He was ASW instructor in Key West, FL until January '61 and served as OIC of Mobile Training Team for 6 months. For 2 years he was CIC Officer on USS Boston.He married Marilyn Bellini in 1964 while on duty as OPS Officer in Keflavik, Iceland. He commanded the USS Pivot for 2 years as LCDR and a command at NAVFAC Sosus, Lewis, DE. At COMINLANT Charleston, SC he served in Readiness and Training and in '71 and '72, Plans Officer CARDIV2 (CDR). At Language School in Monterey, CA, he prepared for duty in Ankara Turkey where he enjoyed interaction with the Turkish Navy. From '76-'78 while serving as Executive Officer for Fleet CORGRU2 he earned his BA from St. Leo College and began to teach classes soon afterward; with an MA in HRA from Pepperdine, he was an adjunct professor followed by counselor and Assistant Director at St. Leo. When teaching became stressful and a disadvantage for his students, he retired. He was a member of Delta Epsilon Honors Society and Delta Nu.He joined ManTech and was Asst. Technical Director when he left in 1985 to join HL Financial Resources then, Systems Exploration as Operations Research Director. He sold insurance with Phoenix HomeLife for several years but when the company moved to Newport News, his interest waned. In 1996, Bob's extraordinary volunteer life began with Citizen's Police Academy. He was one of the first graduates of that group and revised the entire curriculum.TRIAD members know that Bob was a founding father of VB Triad 2000. He served as chair for 3 years and was a voting member of the State Board of Triad for 2 years.Kempsville AARP knew him as a committed member who willingly participated in activities of the club and promoted the mission of AARP for many years, one of which was to provide free tax assistance to seniors.He introduced the File of Life Program in VB which provided medical info for emergency personnel. He was a volunteer in VICAP and involved in RSVP when he served on the Medicare, Medicaid Fraud Team and a LTC counselor. He was called on to help TRIAD members maneuver through the Medicare D maze several years ago. In 1996 he joined Kempsville Lions Club and served in different capacities. He enjoyed perfect attendance for 15 years. He actively participated in all ventures of the club from cooking hot dogs for craft shows to selling brooms and trees; the projects were all about the comradery he loved. He became a Melvin Jones Fellow in 1998 and 2001 and won Lion of the Year in 1997. He kept his membership active although unable to participate any longer.In 2005, Bob was asked to join a group to support the Police Dept, Project Lifesaver. Bob wrote the organizational paper and applied for grants for necessary equipment for those in need.He was a Samaritan House volunteer in 1998 and for years afterward as Intake Coordinator and revised the curriculum.He was a proud docent on the USS Wisconsin and HR Naval Museum accumulating over 1,000 hours on this ship he loved. In 1999 he received the Mayor's Award for Exceptional Accomplishment in Service to Seniors and in 2008 Consumer Recognition Award by all of the people and organizations he served. From 2008-2012, Bob enjoyed being a part of his favorite group, The Mayor's Commission on Aging and extended his association until 2016 as advisory to the Commission. He was a lifetime member of Fleet Reserve Assoc., Naval Institute, Retired Officer's Assoc., and MCOA. Commendation medals awarded: Turkey 1973-75, COMINALANT 1965-71, ComCarDiv2. Military medals: Naval Unit USS Philippine Sea, Korean Presidential Unit Citation, Korean Service with 5 Combat Stars, Republic of Vietnam Unit Citation with Gallantry Crest, Vietnam Service with 7 Combat Stars, Area and Theater Ribbons, Good Conduct 3 years (enlisted).He was preceded in death by his parents, Robert and Clara Bowman, his sister Margaret Ann Fall, brother in law Theodore Reppucci, Aunt Margaret T. Bowman, Aunt Dorothy Manning, and several other family members.Left to remember him, his wife of 52 years Marilyn Catherine Bellini Fall, their son Christopher, wife Sandra Wilkniss and children Alexandra and Leonardo of Arlington, VA., their daughter Alison Brinkmann, husband Stephen and his children Nicholas (CT) and Rhena (WA); his sister Claire Reppucci of Medford, MA, her children, and extended family on the east coastHis life was one of service to his fellow man, particularly seniors in need of assistance. He was a true humanitarian who gave his time and resources to make this a better community.A Celebration of Life will be held at Altmeyer Funeral Home in Virginia Beach, VA on August 28, 2-4pm. Burial will be at Arlington National Cemetery at a later date. Should you care to donate in his honor, please consider Project Lifesaver or Kempsville Lions Club. Condolences can be made at www.altmeyerfh.com. The Kempsville Lions Club was honored to induct its newest member Lion Kathy Pietri. at our February 8, 2018 meeting. Lion Bob Larmore was the master of ceremony and Lion Paul Steele is Lion Kathy's sponsor. Welcome to the Pride! The Kempsville Lions Club was honored to induct its newest member Lion Mike Posta at our July 13, 2017 meeting. Lion Bob Larmore was the master of ceremony and Lion Lewis Falls is Lion Mike's sponsor. Welcome to the Pride! The Kempsville Lions Club was honored to induct its newest member Lion Ron Possanza. at our June 9th, 2016 meeting. Past President, Lion Ron Schneider was the master of ceremony and Lion Tim Kelly is Lion Ron's sponsor. A slideshow of the event is below. Welcome to the Pride! Thank you to Past President Lion Ron Schneider for his commitment to our club by introducing the Kempsville Lions Club and Lionism to this new member. See you at the next event! The Kempsville Lions Club was honored to induct its newest member Lion Mark Foushee. at our May 12th, 2016 meeting. Past President, Lion Ron Schneider was the master of ceremony and wife Lion Angela Foushee is Lion Mark's sponsor. A slideshow of the event is below. Welcome to the Pride! On May 7, 2016 members of the Kempsville Lions Club and both St. Andrew's United Methodist Church and Church of the Ascension came together for a common cause - feeding the hungry. The packaging began at 9:00 am and was completed by 11:30 with over 30,000 meals being packaged. St. Andrew's UMC went over the 200,000 meal mark in its history with the program. Each bag cost $.29 cents to make and feeds six people. Thanks to all those who setup and cleaned up before/after the event and to ALL those who selflessly gave of their time to assist in packaging meals. Thank you to the Kempsville community for coming out and supporting our club and the Stop Hunger Now program. We couldn't support our community without our community supporting us, so Thank You. See you at the next event! The Kempsville Lions Club held our Spring 2016 Blind Made Broom Sale at Fairfield Shopping Center on April 30th, 2016 from 10:00 am until 4:00 pm. It was a steady flow of people looking for our quality brooms. In the end we raised over $600.00 dollars for our Sight and Hearing Programs. Please enjoy the slideshow of our participants in this sale. 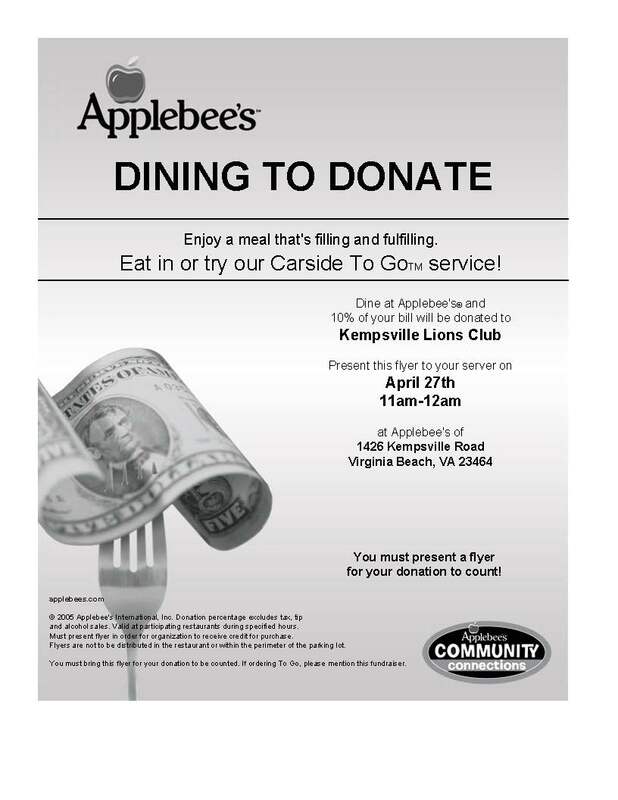 The Kempsville Lions Club will be holding a Fundraiser at the Kempsville location of Applebee's April 27th from 11:00 am - 12:00 am. You must print the flyer and preset it to your server. Please clck on the image below to download the .PDF version. Come out and support a club that has been serving its community for over 60 years! We thank you for your support of our Club and look forward to serving our community in the future! The Kempsville Lions Club will be holding its 26th Annual Charity Golf Tournament and District Governor's Cup on Friday, April 22nd 2016 at Heron Ridge Golf Club located in Virginia Beach. Forms and application can be found on our Golf Tourney page. Please let us know if you have any questions or comments. Come out and support a club that has been serving its community for over 60 years! We thank you for your support of our Club and look forward to serving our community in the future! See you on the links! 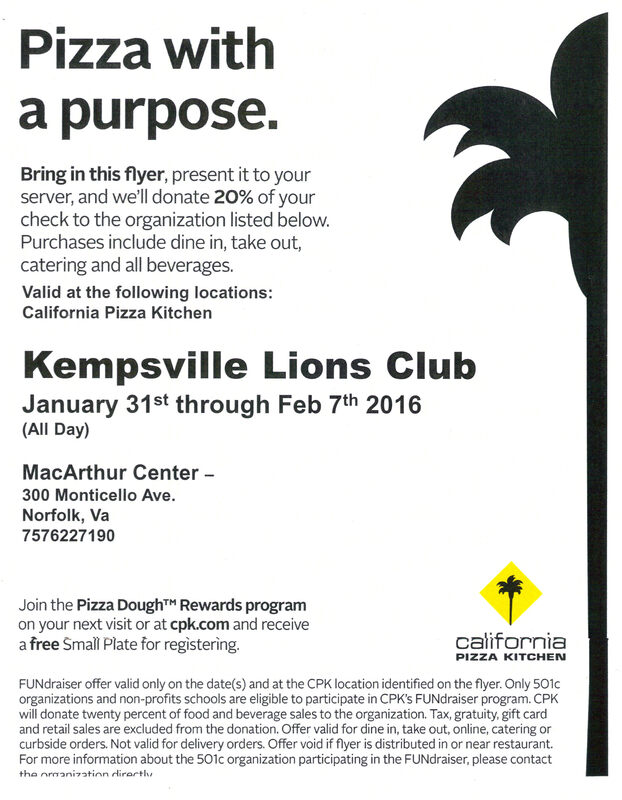 The Kempsville Lions Club will be holding a Fundraiser at the MacArthur Center location of California Pizza Kitchen January 31st through February 7th. They will donate 20% if you show the below image on your smartphone or print and bring in the .PDF. Please clck on the image below to download the .PDF version. Come out and support a club that has been serving its community for over 60 years! The Kempsville Lions Club was honored to inuduct its newest member Lion Robert Frye, Sr. at our November 12th meeting. Past District Governor, Lion Bud Warren was the master of ceremony and Lion Bobbie Holt is Lion Robert's sponsor. Welcome to the Pride! Thank you to PDG Lion Bud Warren for his commitment to our club by introducing the Kempsville Lions Club and Lionism to these two fine new members. See you at the next event! The Kempsville Lions Club was honored to inuduct Lion Bobbie Holt at our October 8th meeting. Past District Governor, Lion Don Burson was the master of ceremony and Past District Governor, Lion Bud Warren is Lion Bobbie's sponsor. October was our Membership Drive for our Club. We had 6 prospective members attend. See you at the next event! The Kempsville Lions Club held its monthly meeting on July 9, 2015 at Emmanuel Episcopal Church. Congratualtions to Ed Ellison who was presented the Melvin Jones Fellow Award. So what do you do when you have a President that likes to give out "Game Balls" to those who make a difference in the Club and Community? The incoming President and the Tail Twister rent a Dunk Tank and auction off everything from who goes in to who throws first as a fundraiser for the club's Activities Fund. Everyone had a BLAST. Thanks to ALL the Lions, their families and their spouses for attending and participating. It was a GREAT night of fun for all of us. See you at the next event! The Kempsville Lions Club held its 62nd Annual Installation & Charter Night Dinner on June 11, 2015 at Emmanuel Episcopal Church. Congratualtions to Lion Debi Lupton for being awarded 2014-2015 Lion of the Year and to Lion Ed Ellison for being named 2014-2015 Melvin Jones Fellow. Thanks to ALL the Lions and their spouses for attending and participating. It was a GREAT night for all of us and a sense of pride in our Club. See you at the next event! Please feel free to browse through our site. You can find information on who we are and what we do to serve those in need. More specifically, you can find information on the activities and events our Club takes part in, as well as a schedule of upcoming events. If you have any questions about our Club or services we provide, please contact us by Clicking Here. Make sure to Sign our Guestbook to let us know you were here and what you thought of our site and your visit. "Do you have a favorite Social Media site that's not listed here? Click here to send us an Email and let us know about it."